CNG: eAuction 157. Mark Antony. 40 BC. AR Denarius (18mm, 3.08 g). Military mint travelling with Antony in Greece. L. Munatius Plancus, moneyer. 157, Lot: 254. Estimate $300. Sold for $333. This amount does not include the buyer’s fee. Mark Antony. 40 BC. 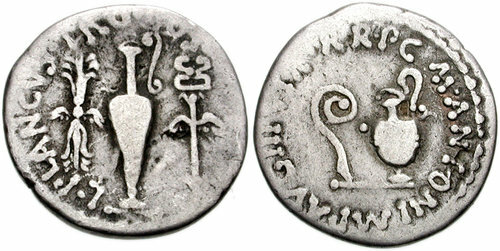 AR Denarius (18mm, 3.08 g). Military mint travelling with Antony in Greece. L. Munatius Plancus, moneyer. Lituus and vase / Thunderbolt, vase, and caduceus. Crawford 522/2; CRI 253; Sydenham 1190; RSC 24. Fine, Rare.